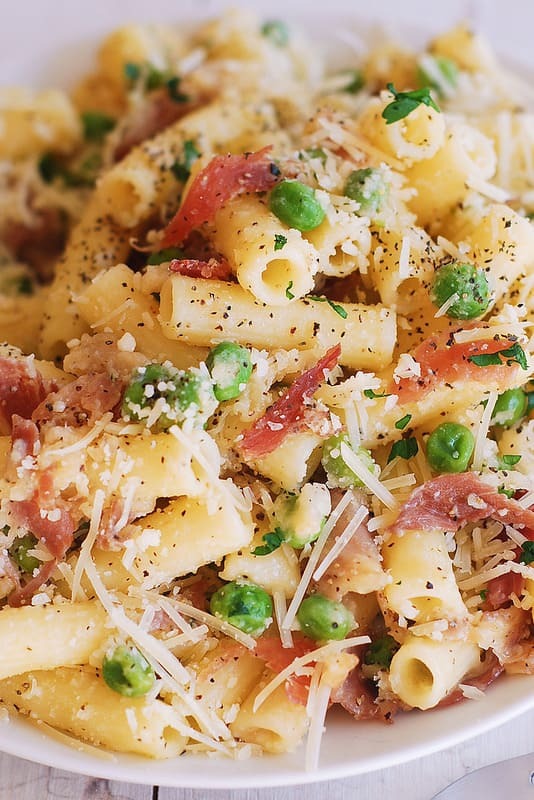 Prosciutto Pasta with Peas and Parmesan Cheese – simple and quick recipe, only 30 minutes from start to finish. Delicious and very Italian! The sauce for this prosciutto pasta recipe is made with just butter and shredded Parmesan cheese, no cream involved. First, cook the prosciutto a little bit in the butter to release some of its juiciness and saltiness. Add black pepper. Next, add shredded Parmesan cheese and stir everything to combine on medium heat. The cheese melts nicely around the butter and coats the pasta. The cheese should melt just fine with all the butter but if you find the pasta and the sauce too dry, just add a small amount of reserved pasta water, only about 1/4 cup, on medium heat. But, really, you won’t need to, most likely. Prosciutto is an Italian cured ham. It is usually sliced very thinly. It has a buttery sweet and salty flavor that melts in your mouth. If you want to learn more about prosciutto, here are two really good articles to read: the Difference Between Bacon, Pancetta, and Prosciutto and What Is Prosciutto? What are the best ways to eat prosciutto? In Italy, it’s usually served as antipasto, alongside tomatoes, Mozzarella cheese, or Burrata cheese, or with a melon. Italians love prosciutto in sandwiches. It’s often used in pasta. It’s also a popular topping on pizzas. 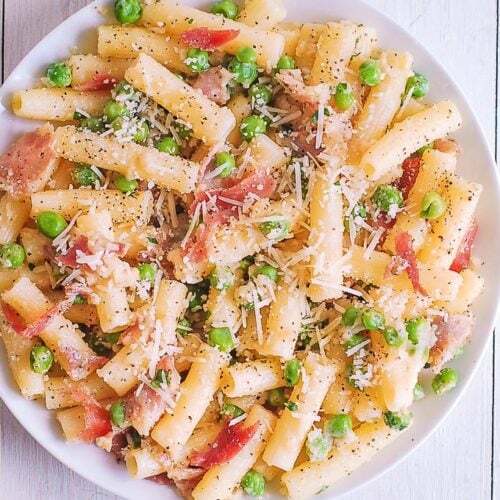 Prosciutto is really delicious in pasta. It’s already so salty, you will likely not need to season your pasta with salt. 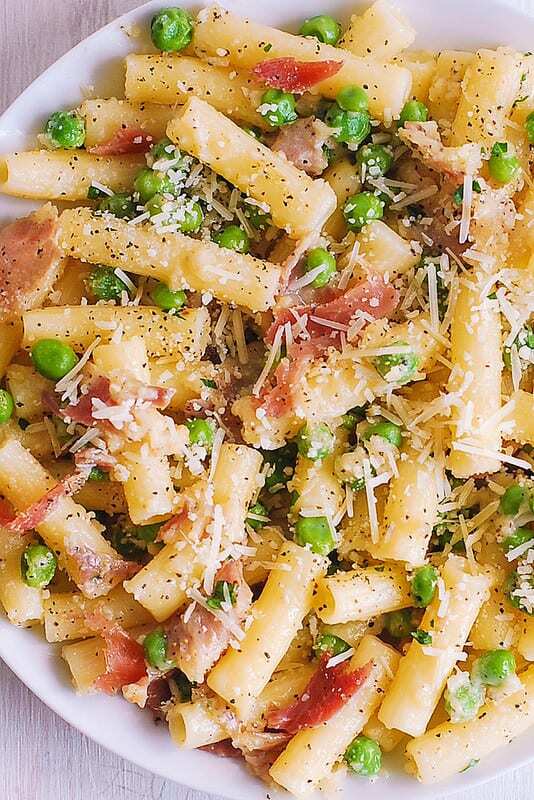 When your prosciutto pasta with peas is ready, sprinkle it with shredded or grated Parmesan cheese. 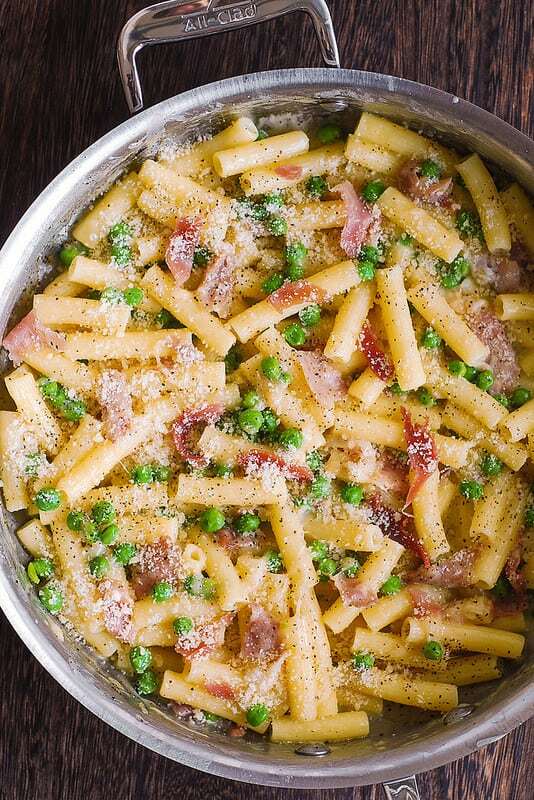 Simple pasta recipe made in 30 minutes: Prosciutto Pasta with Peas and Parmesan Cheese. Cook pasta in boiling water until al dente. During last 5-7 minutes of cooking, add frozen peas and continue boiling both the pasta and frozen peas for 5-7 more minutes. Drain. Reserve 1/2 cup pasta water. Tear prosciutto into smaller pieces. In a large skillet, heat 2 tablespoons butter on medium heat. Add the torn prosciutto and stir to coat it with butter, for about 1 minute. Add black pepper. Add another 2 tablespoons of butter and stir until melted. 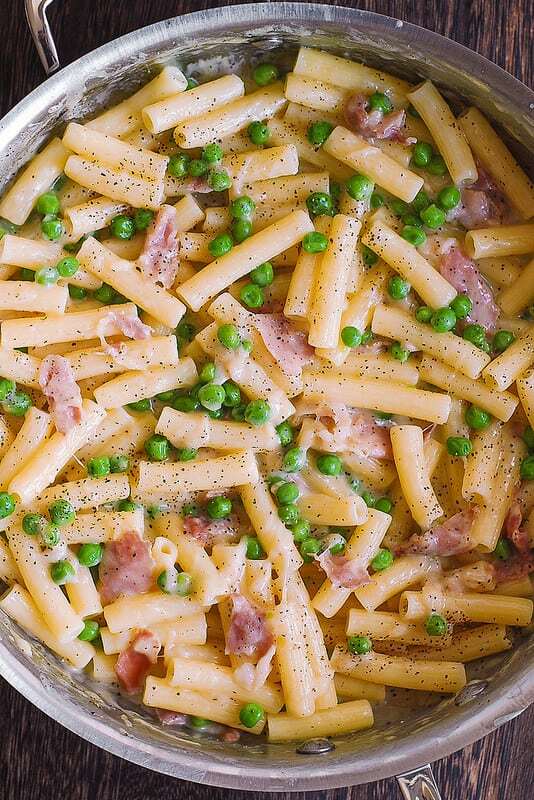 To the skillet with butter and prosciutto add drained cooked pasta with peas. Sprinkle 3/4 cup shredded Parmesan cheese evenly over pasta. Stir everything together on medium heat until the cheese melts. If needed, add a small amount of pasta water (about 1/4 cup) - but you might not need to. I am so happy you enjoyed this recipe! Yes, this is one of those recipes that looks quite fancy and tastes really good, too. And the best part is that it’s so easy! Perfect for the guests, you’re right! Making this for dinner tomorrow night. Can’t wait. I like this twist of no cream sauce but still a very flavorful, delicious meal! 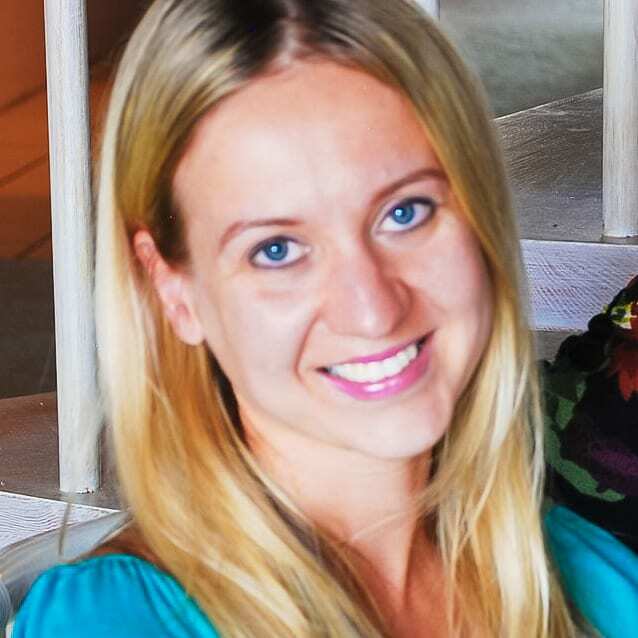 Good idea – thanks!